Last year, I had the honor to help write TRIUMF’s Five-Year Plan for 2020-2025. TRIUMF is Canada’s particle accelerator center, located next to the University of British Columbia’s campus in Vancouver, and it tackles some of the biggest problems facing physics today. Every five years, research facilities in Canada prepare comprehensive documents outlining their strategies for the next five. In this case, TRIUMF asked me to join their writer team and I was specifically tasked with collaborating with TRIUMF’s management to develop and write the Implementation Plan (PDF) — basically an expanded version of the Strategic Plan (PDF) — detailing the key initiatives the center will carry out between 2020 and 2025. As the location of the world’s largest and oldest operational cyclotron, the center is a multi-faceted physics lab with hundreds of scientists and engineers working on everything from understanding the origins of matter to developing radiopharmaceuticals to treat late-stage cancers. I only had a vague understanding about the scope of TRIUMF’s work before last year, but, as the months progressed after visiting the center in April 2018, I was treated to an unparalleled learning experience that was as dizzying as it was rewarding. As a science communicator, I wanted to understand what makes TRIUMF “tick,” so I decided to speak to as many TRIUMF scientists, engineers, collaborators, and managers as possible. During my interviews, I was excited and humbled to hear stories of science breakthroughs, personal achievements and mind-bending physics concepts, so I included a series of miniature articles to complement the Implementation Plan’s text. As the Five-Year Plan is a public document (you can download the whole Plan here, in English and French), I’ve been given permission by TRIUMF to re-publish these articles on Astroengine. Background: To kick off the series, we’ll begin with nuclear science. Specifically, how astrophysical processes create heavy elements and how TRIUMF studies the formation of radioisotopes in the wake of neutron star collisions. After the 2017 LIGO detection of gravitational waves caused by the collision of two neutron stars (get the details here), and the near-simultaneous detection of a gamma-ray burst from the same location, scientists heralded a new era for astronomy — nicknamed “multimessenger astronomy,” where gravitational wave and electromagnetic signals measured at the same time from the same event can create a new understanding of astrophysical processes. In this case, as it was confirmed to be a neutron star merger — an event that is theorized to generate r-process elements — spectroscopic analysis of the GRB’s afterglow confirmed that, yes, neutron star collisions do indeed create the neutron-rich breeding ground for heavy elements (like gold and platinum). Although multimessenger astronomy may be a new thing, TRIUMF has been testing these theories in the laboratory environment for years, using rare isotope beams colliding into targets that mimic the nuclear processes that produce the heavy elements in our universe. This process is known as nucleogenesis, and it’s how our cosmos forges the elements that underpin stardust, the stuff that makes the planets, stars, and the building blocks of life. For this mini-article, I had a fascinating chat with Dr. Iris Dillmann, a nuclear physics research scientist at TRIUMF. I’ve lightly edited the text for context and clarity. The original article can be found on page 22 of the Implementation Plan (PDF). The article: TRIUMF’s investigations into neutron-rich isotopes were well-established before the advent of multi-messenger astronomy. “It was a cherry on top of the cake to get this confirmation, but the experimental program was already going on,” said Dillmann. Whereas the combination of gravitational waves and electromagnetic radiation from astrophysical events gives rise to a new era of multi-messenger astronomy, TRIUMF’s Isotope Separator and Accelerator (ISAC) facilitates the investigation of heavy isotopes through an array of nuclear physics experiments all under one roof that can illuminate the characteristics of isotopes that have been identified in neutron star mergers. From there, Dillmann added, the Gamma-Ray Infrastructure For Fundamental Investigations of Nuclei (GRIFFIN) experiment can use decay spectroscopy to investigate the half-lives of rare isotope beams and their underlying nuclear structure. Other nuclear properties such as moments and charge radii can be measured using laser spectroscopy. TRIUMF scientists can also directly measure the reaction cross-sections of explosive hydrogen and helium burning in star explosions with the Detector of Recoils And Gammas Of Nuclear reactions experiment (DRAGON) and the TRIUMF UK Detector Array (TUDA). With ISAC, all these measurements are carried out in one place, where teams from each experiment work side by side to solve problems quickly and collaborate effectively. “We have the setups in the hall to investigate an isotope from different perspectives to try to get a complete picture just from one department — the nuclear physics department,” said Dillmann. …because I have a “PhD” in TRIUMFology! Not sure if I can include it in my resume, but I love the honor all the same. Thanks Team TRIUMF! It has only been a couple of years since the first historic detection of gravitational waves, but now physicists are already dissecting a handful of signals that emanated hundreds of millions of light-years away to elucidate how some of the most violent events in our universe work. Most of the gravitational wave signals detected so far involve the merger of black holes, but one signal, detected on Aug. 17, 2017, was special—it was caused by the smashup of two neutron stars. This merger also generated a powerful gamma-ray burst (GRB) that was detected at nearly the same time, linking GRBs with neutron star mergers and highlighting where heavy elements in our universe are forged. A new era of “multimessenger astronomy” had begun. Now, the signal (designated GW170817) has been reanalyzed to understand what happened after the merger. Analysis that came before suggested that the collision of the two neutron stars would have tipped the mass balance to create a black hole. 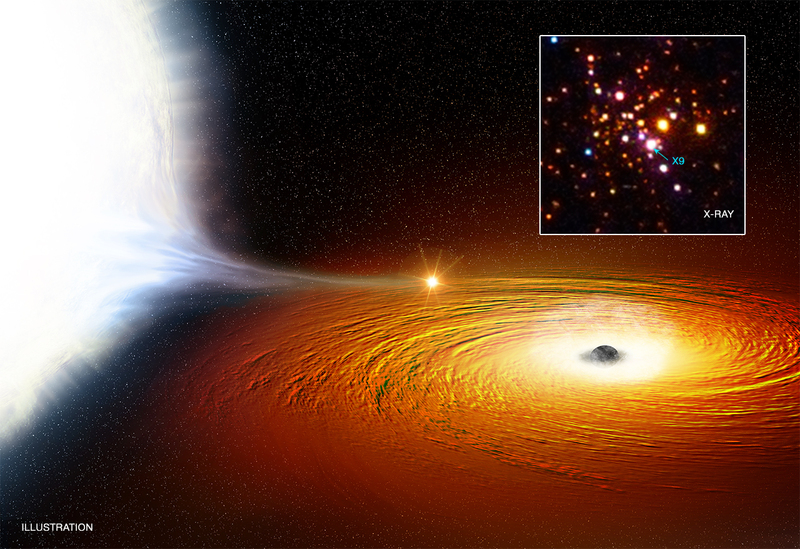 According to a new study, published in the journal Monthly Notices of the Royal Astronomical Society: Letters, two physicists suggest a contradictory scenario: GW170817 didn’t create a black hole, it produced a hypermassive neutron star, instead. The secret behind this finding focuses on the datasets recorded by the US-based Laser Interferometer Gravitational-wave Observatory (LIGO) and Italian Virgo observatory. When gravitational waves are recorded during a black hole or neutron star merger event, their frequency rapidly increases (as the objects orbit one another faster and faster as they get closer and closer) and then abruptly cuts off (when they collide). When turned into an audio file, mergers sound like “chirps.” Apart from sounding like an eerie bird call coming from deep space, physicists have been able to extract surprisingly detailed information from the conditions of the merging objects, such as their mass and rates of spin. And this is where van Putten’s work comes in. Working with Massimo della Valle of the Osservatorio Astronomico de Capodimonte in Italy, the duo applied a new analysis technique to these data and detected a 5-second descending “chirp” (as shown by the downward arrow in the graph above). This descending chirp happened immediately after the GRB was detected coming from the same location as the gravitational wave signal’s origin. According to their analysis, the spin-down—from 1 KHz to 49 Hz—was most likely representative of a very massive neutron star and not a black hole. If corroborated, this discovery could have profound implications for astrophysics. How hypermassive neutron stars (like the one that was created by GW170817) can exist without collapsing into a black hole will likely keep theorists busy for some time and physicists will be hopeful for another gravitational wave event like GW170817. The galaxy may be filled with weird stellar wonders, but you’d be hard-pressed to find a binary system stranger than WD1202-024. First thought to be an isolated white dwarf star approximately 40% the mass of our sun, astronomers studying observational data from NASA’s Kepler space telescope realized the stellar husk has company. In an extremely fast 71-minute orbit, the star has a brown dwarf, 67 times the mass of Jupiter, in tow — an unprecedented find. White dwarfs are formed after sun-like stars run out of fuel and die. This will be the fate of our sun in about five billion years time, after it becomes depleted of hydrogen in its core and puffs-up into a red giant. Shedding its outer layers after a period of violent stellar turmoil, a planetary nebula will form with a tiny mass of degenerate matter — a white dwarf — in its center. Earth would be toast long before the sun turns into a red giant, however. But in the case of WD1202-024, it seems that when it was a young star (before it passed through its final red giant phase), it had a brown dwarf in orbit. Commonly known as “failed stars,” brown dwarfs are not massive enough to sustain sufficient fusion in their cores to spark the formation of a star. But they’re too massive to be called planets as they possess the internal circulation of material that is more familiar to stars (so with that in mind, I like to refer to brown dwarfs as “overachieving planets”). They are the bridge between stars and planets and fascinating objects in their own right. But the brown dwarf in the WD1202 binary couldn’t have formed with only a 71-minute orbit around the white dwarf; it would have evolved further away. So what happened? After carrying out computer simulations of the system, the international team of researchers found a possible answer. In the future, the researchers hypothesize, the brown dwarf will continue to orbit the white dwarf until energy is depleted from the system via gravitational waves. In less than 250 million years, the orbital distance will be so small that the extreme tidal forces exerted by the white dwarf will start to drag brown dwarf material into the star, cannibalizing it. This will turn WD1202 into a cataclysmic variable (CV), causing its brightness to flicker as the brown dwarf material is extruded into an accretion disk orbiting the white dwarf. Imagine speeding down the highway and plowing into an unfortunate swarm of mosquitoes. Now imagine that you had the ability to precisely measure the mass of each mosquito, the speed at which it was traveling and the direction it was going before it exploded over your windscreen. Granted, the technology to accomplish that probably isn’t feasible in such an uncontrolled environment. Factors such as vibration from the car’s motor and tires on the road, plus wind and air turbulence will completely drown out any “splat” from a minuscule insect’s body, rendering any signal difficult to decipher from noise. But move your hypothetical “car and mosquitoes” into space — as silly as that may sound — and things become a lot less noisy. And now NASA is measuring its own special kind of “mosquito splat” signal by using a rather unlikely space experiment. 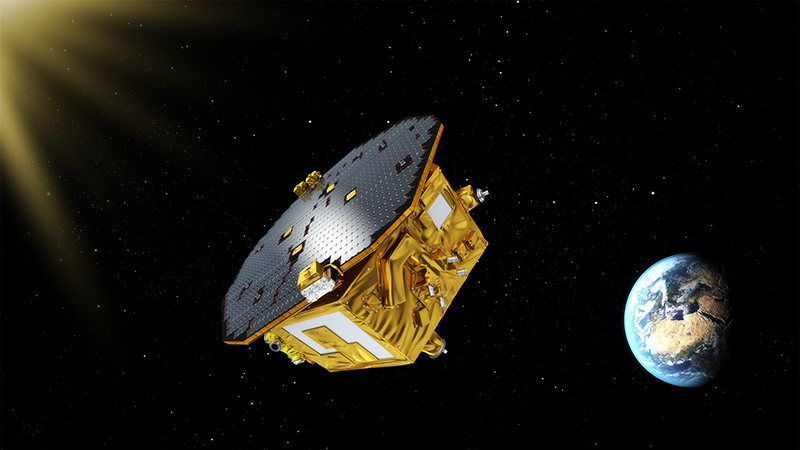 The European LISA Pathfinder spacecraft is a proof of concept mission that’s currently in space, orbiting a region of gravitational stability between the Earth and the sun — called the L1 point located a million miles away. The spacecraft was launched there in late 2015 to carry out precision tests of instruments that will eventually be used in the space-based gravitational wave detector eLISA. Inside the payload is a miniaturized laser interferometer system that measures the distance between two test masses. When launched in 2034, eLISA (which stands for Evolved Laser Interferometer Space Antenna) will see three spacecraft, orbiting the sun at the L1 point, firing ultra-precise lasers at one another as part of a space-based gravitational wave detector. Now we actually know gravitational waves exist — after the US-based Laser Interferometer Gravitational-wave Observatory (or LIGO) detected the space-time ripples created after the collisions of black holes — excitement is building that we might, one day, be able to measure other phenomena, such as the ultra-low frequency gravitational waves that were created during the Big Bang. Although LISA Pathfinder is a test (albeit a history-making test of incredible engineering ingenuity), NASA thinks that it could actually be used as an observatory in its own right; not for hunting gravitational waves, but for detecting comet dust. Like our mosquito-windscreen analogy, spacecraft get hit by tiny particles all the time, and LISA Pathfinder is no exception. These micrometeoroides come from eons of evaporating comets and colliding asteroids. Although measuring less than the size of a grain of sand, these tiny particles zip around interplanetary space at astonishing speeds — well over 22,000 miles per hour (that’s 22 times faster than a hyper-velocity rifle round) — and can damage spacecraft over time, slowly eroding unprotected hardware. Therefore, it would be nice if we could create a map of regions in the solar system that contain lots of these particles so we can be better prepared to face the risk. Although models of solar system evolution help and we can estimate the distribution of these particles, they’ve only ever been measured near Earth, so it would be advantageous to find the “ground truth” and measure them directly from another, unexplored region of the solar system. This is where LISA Pathfinder comes in. As the spacecraft gets hit by these minuscule particles, although they are tiny, their high speed ensures they pack a measurable punch. As scientists want the test weights inside the spacecraft to be completely shielded from any external force — whether that’s radiation pressure from the sun or marauding micro-space rocks — the spacecraft has been engineered to be an ultra-precise container that carefully adjusts its orientation an exact amount to directly counter these external forces (hence the “ultra-precise micro-propulsion system”). This bit is pretty awesome: Whenever these tiny space particles hit the spacecraft, it compensates for the impact and that compensation is registered as a “blip” in the telemetry being beamed back to Earth. After careful analysis of the various data streams, researchers are learning a surprising amount of information about these micrometeoroides — such as their mass, speed, direction of travel and even their possible origin! — all for the ultimate goal of getting to know the tiny pieces of junk that whiz around space. So, it turns out that you can precisely measure a mosquito impact on your car’s windshield — so long as that “mosquito” is a particle of space dust and your “car” is a spacecraft a million miles from Earth. During the hunt for the predicted ripples in space-time — known as gravitational waves — physicists stumbled across a rather puzzling phenomenon. Last year, I reported about the findings of scientists using the GEO600 experiment in Germany. Although the hi-tech piece of kit hadn’t turned up evidence for the gravitational waves it was seeking, it did turn up a lot of noise. Before we can understand what this “noise” is, we need to understand how equipment designed to look for the space-time ripples caused by collisions between black holes and supernova explosions. Gravitational wave detectors are incredibly sensitive to the tiniest change in distance. For example, the GEO600 experiment can detect a fluctuation of an atomic radius over a distance from the Earth to the Sun. This is achieved by firing a laser down a 600 meter long tube where it is split, reflected and directed into an interferometer. The interferometer can detect the tiny phase shifts in the two beams of light predicted to occur should a gravitational wave pass through our local volume of space. This wave is theorized to slightly change the distance between physical objects. Should GEO600 detect a phase change, it could be indicative of a slight change in distance, thus the passage of a gravitational wave. While looking out for a gravitational wave signal, scientists at GEO600 noticed something bizarre. There was inexplicable static in the results they were gathering. After canceling out all artificial sources of the noise, they called in the help of Fermilab’s Craig Hogan to see if his expertise of the quantum world help shed light on this anomalous noise. His response was as baffling as it was mind-blowing. “It looks like GEO600 is being buffeted by the microscopic quantum convulsions of space-time,” Hogan said. The signal being detected by GEO600 isn’t a noise source that’s been overlooked, Hogan believes GEO600 is seeing quantum fluctuations in the fabric of space-time itself. This is where things start to get a little freaky. According to Einstein’s view on the universe, space-time should be smooth and continuous. However, this view may need to be modified as space-time may be composed of quantum “points” if Hogan’s theory is correct. At its finest scale, we should be able to probe down the “Planck length” which measures 10-35 meters. But the GEO600 experiment detected noise at scales of less than 10-15 meters. As it turns out, Hogan thinks that noise at these scales are caused by a holographic projection from the horizon of our universe. A good analogy is to think about how an image becomes more and more blurry or pixelated the more you zoom in on it. The projection starts off at Planck scale lengths at the Universe’s event horizon, but its projection becomes blurry in our local space-time. This hypothesis comes out of black hole research where the information that falls into a black hole is “encoded” in the black hole’s event horizon. For the holographic universe to hold true, information must be encoded in the outermost reaches of the Universe and it is projected into our 3 dimensional world. Currently under construction in Fermilab, the Holometer (meaning holographic interferometer) will delve deep into this quantum realm at smaller scales than the GEO600 experiment. If Hogan’s idea is correct, the Holometer should detect this quantum noise in the fabric of space-time, throwing our whole perception of the Universe into a spin. Forget building gravitational wave detectors costing hundreds of millions of dollars (I’m looking at you, LIGO), make use of the most accurate cosmic timekeepers instead and save a bundle. The North American Nanohertz Observatory for Gravitational Waves (NANOGrav) is a proposal that involves closely monitoring the regular flashes of spinning neutron stars (or pulsars) to detect very slight “shimmers” in their signal. Although the physics is crazy-complex, by tracking these shimmers over a suitably distributed number of pulsars could reveal the passage of gravitational waves. The problem is that you need to closely monitor rapidly-spinning millisecond pulsars, which are (a) tough to find (only 150 have been found over nearly three decades since pulsars were first discovered), and (b) not very plentiful in the part of the night sky of interest to scientists (northern hemisphere). They tend to clump together in globular star clusters, which makes them useless for detecting gravitational waves. However, according to results announced by the National Radio Astronomy Observatory (NRAO) at this week’s American Astronomical Society (AAS) meeting in Washington D.C., they’ve discovered 17 new pulsars with the help of NASA’s Fermi Gamma-Ray Space Telescope. You have to wonder whether building the Laser Interferometer Gravitational-Wave Observatory (LIGO) was worth it (but you can’t be too careful, some terrorist organizations might want to use gravitational waves for evil, so it would be good if we detected them first).